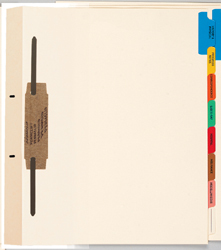 Our fileback dividers organize large medical record charts for easier and more efficient access to patient information. Fileback Features: Heavy-duty 9 point manila stock (110 lb. ivory stock), black ink printing &typesetting of tab titles, 2" bonded fastener, collated into sets, tab printed on both sides, mylar reinforced fastener slots for rip-resistance, square corners, clear and assorted colors of mylar - filebacks can be pre-installed into any file folder - contact Franklin Mills for assistance.